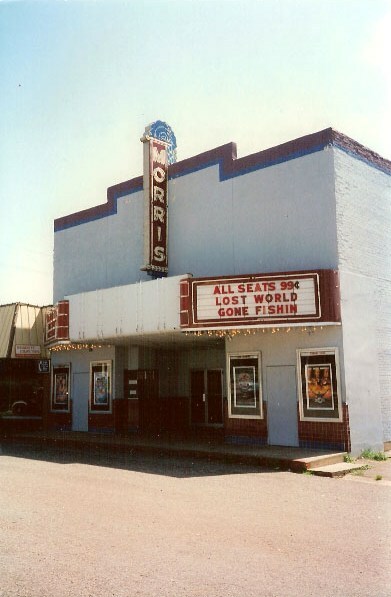 Daingerfield, Texas, Morris County seat. The community was named in honor of Capt. London Daingerfield who was killed in an 1830 battle with Indians on the site that became the town in the1840s. 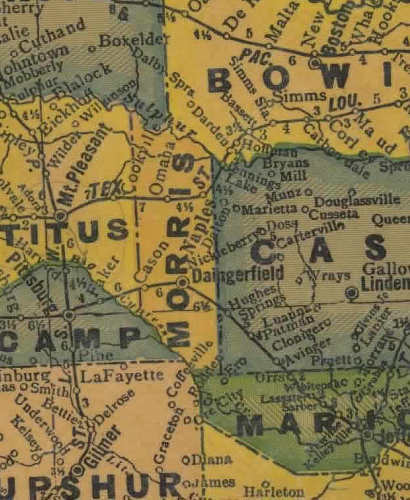 1877: Titus County divided forming Morris County and Daingerfield became county seat. The Louisiana, Arkansas and Texas came within a half-mile of the town. Lone Star Steel and the United States Navy Ordnance Aerophysics Lab open shortly after WWII. Daingerfield, the county seat of Morris County, was named for Captain London Daingerfield, supposedly a native of Nova Scotia, but beyond that and a few other facts, Captain Daingerfield remains a mystery man. Morris County pioneers told stories of finding Daingefield抯 millstone and water well, which pre-dated local Anglo-American history. These items were likely made by Acadian settlers from Louisiana Territory, but they returned to the territory because of Indian hostilities in what became Texas. A spring known locally as Daingerfield Spring was once a popular camp used by Indians such as the Choctaws and Caddoes. Around 1830, Captain Daingerfield and a company of 100 men attacked an Indian village at the spring and, after a long, bloody fight, the Indians were driven away. Local history says Captain Daingerfield then settled his family around the spring, but the Indians retaliated, killing Daingerfield, his wife and children. The Captain and his family were likely buried nearby with large flat rocks marking their graves. But as the years passed, the cemetery and rocks were moved as new homes were built in the area. In those days, it was the custom of settlers to plant cedar trees around the graves of their loved ones. Near the spot where the Daingerfields were buried, large cedars are now growing. The problem of finding more about Captain Daingerfield is compounded by the fact that Morris and the surrounding counties were once a part of Arkansas. Army records in Washington have no record of Daingerfield and, despite the efforts of several historians to unearth more details about the captain, his family and his fellow soldiers, his disappearance remains one of the legendary stories of East Texas. Some early visitors were not kind to the early town of Daingerfield. William A. McClintock, who passed through the area in 1846, noted in his diary that the town consisted of "three or four cabins scarcely fit for pigsties." But by the early 1850s the town began to grow. Sylvia Academy, a private school for girls, opened around 1850, and in 1852 the Marshall Presbytery of the Cumberland Presbyterian Church founded Chapel Hill College.